It's been hot - It's daiquiri time! We have seen some extreme temperatures here in the Seattle area over the past few days and when it's hot like this we like to have strawberry daiquiris on hand for guests that stop by. A friend gave us this recipe awhile back. She only gave us the ingredients not the specific amounts of each item, so it's a bit of a guessing game or tasting game with this recipe! Experiment with it, it is a delicious treat for a hot summer evening. Stir the ingredients together then secure the lid on the tub and put it in the freezer. Leave it in the freezer for at least a full day. Pull the tub out of the freezer 1/2 hour before you want to serve it, stir it up and it will be the perfect slushy consistency. If you don't use it all, put the lid back on and stick it back in the freezer for the next time. 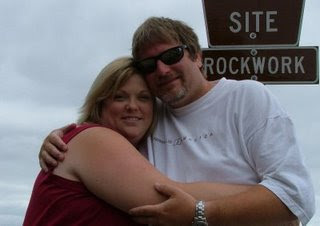 We are in desparate need of JUNK therapy! 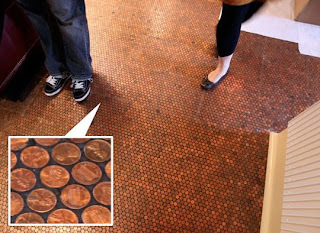 A client once told us she wanted copper tile as a backsplash in her kitchen but her budget wouldn't allow it so she used pennies instead. Here is a photo that uses the same technique on a floor. We love the subtle shimmer the timeworn pennies give off against the black grout. 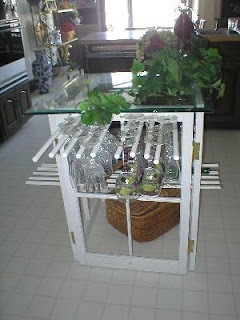 Here is another creative use for old windows, make a bar or an island out of them. It is super simple just some hinges, dowels and a sheet of glass. It looks funky and fun! 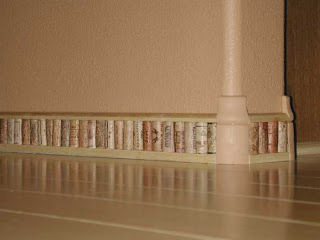 Here old wine corks were used as floor molding. 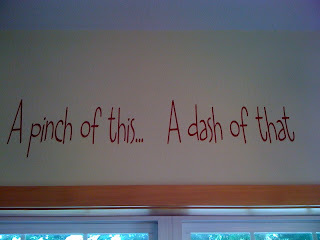 This is a great way to ad some whimsy to a dining room. This project would take a whole lotta corks but you sure could have a darn good time drinking all of those bottles! 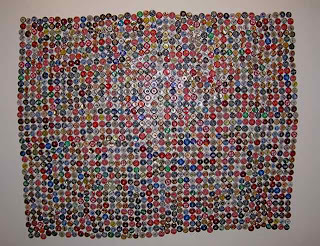 One more thing, it's the same concept as the pennies, these are bottle caps. At first we thought they were buttons (buttons could probably be used in the same way). 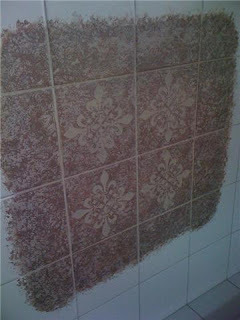 Kind of reminds us of the glass tiles that are so popular now. We could see using this in the man cave, guys would love it! Ok fellow junkers, we need to ponder over some of your creative ideas to keep our spirits up, so share some ideas with us by commenting. We love to read about the ideas you have too. 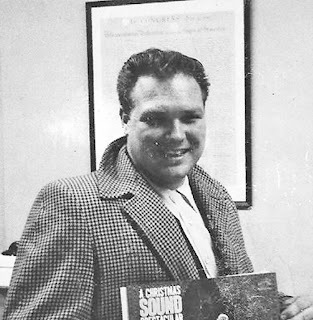 It's been a sad time for the funky junk family, our father passed away last week and we are back at home visiting family and friends. Had to get up a little earlier than usual this morning to talk with them, but it was worth it. They are a whole lotta fun! Listen in sometime and see for yourself, you can find them here. 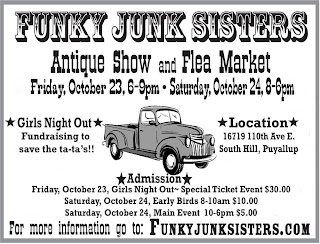 We have added something new to our Fall Funky Junk Sisters Antique Show and Flea Market , it is a fundraising event for "Save the Ta Tas". This event gets you into our show early to shop and gives you a chance to donate to a good cause that effects so many women. There will be refreshments, special discounts and lots of pampering for all of you Junk Queens. This is the perfect excuse to have a girls night out. Call up all of your Sistas and make it a date. You can get more info from our website http://www.funkyjunksisters.com/. We are suppose to be working on landscaping our yard...but we got side tracked. We have knocked down a fence and opened up a new area to our yard. 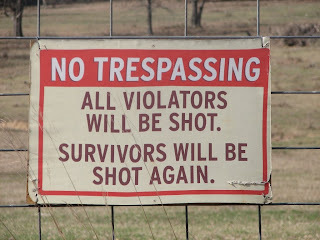 Today we were searching the internet for landscaping ideas and wouldn't you know it we got sidetracked by this sign. 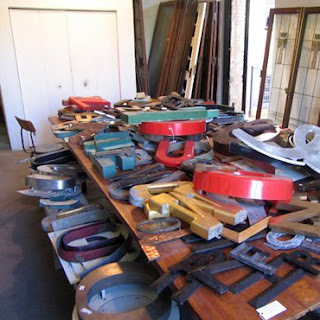 We have told you before that we love old signs, so off we went on a tangent. Couldn't you just imagine this in the back 40? Old signs are fun and they add tons of personality to indoor or outdoor decor. 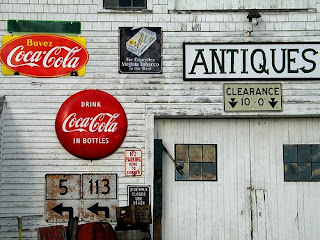 When you are out at garage sales, fleas or thrift stores look for them and don't forget to pick up letters from old business signs too. They can add a little whimsy to your walls. 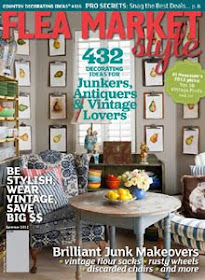 The Funky Junk Sisters Talk with Ella Hatfield about her secrets to transform flea market finds. Ella was a vendor at our June Funky Junk Sisters Show. 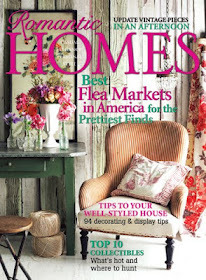 In this video she gives us a few tips on how to transform flea market and thrift store finds. You can find Ella's booth "The Back Porch" at The Exhibitors Mall in Puyallup, WA. Thanks to Ella for all of the great info! Today I didn't have to venture far to find a flea market. The Exhibitors Mall on South Hill put on a fabulous one. 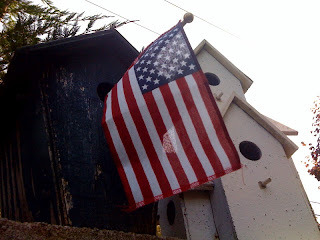 I took a few pics to share with you. 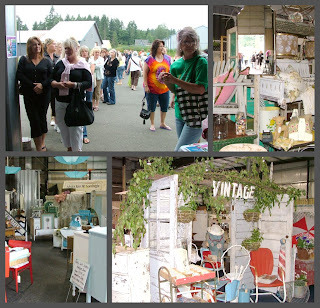 The Exhibitors is a crafter's mall where vendors can rent space to sell their wares. There is so much talent here, I will only be able to show you a small part of it. I loved their mission statement and it is painted on the wall for everyone to see. This weekend they expanded to the outdoors, they offered music, espresso, smoothies and a whole lot of fun. This is Sonia of The Secret Garden Tea Room. You can reserve her tea room for special events and private parties. It was a beautiful sunny day and these ladies were busy preparing drinks for all the shoppers. This was Victoria's (vbsingers@gmail.com) space. She surely is a talented lady. 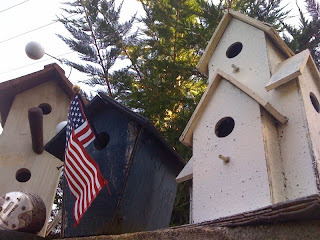 She specializes in handmade, french chic and salvage styles. I especially loved her soap display. Lisa, a fellow blogger, bakes the best cupcakes, they are to die for. This purse is fun. You can purchase it from Two Laughing Hens. Kim Marie is the owner of The Exhibitor's Mall (253-841-0769). I love that she gives all of these people the opportunity to be creative and sell their things in a brick & mortar store. Evergreen Flowers of Sumner (253-891-1020)had a great selection of plants for sale. AnnaB put together this sweet planter. You can find her booth here everyday. Pin Up Girls are so collectible. Michelle Renee had this old doll suitcase for sale in her booth. Michelle's sister, Izabellah is talented too. 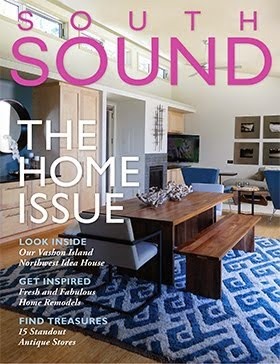 She made this and she shared a secret with me about being published in Somerset magazine. Most of these vendors have space inside the store but this outdoor party lasts through the weekend, grab a friend and drive up there. It's alot of fun and you'll be glad you did! I'll have more on this tomorrow! 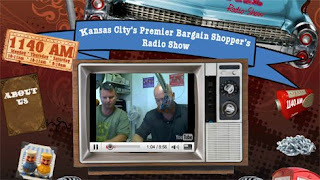 This morning Dixie received a call from The Junkmafia, a radio show in Kansas City. They are interested in doing a broadcast from our October Funky Junk Sisters Show!! Can we tell you how excited we are?! That means all of you Junk Queens out there better have your best game on for this show. The word is out that we put on an awesome JUNKAPALOOZA!! Make plans to attend NOW! Our Fall Show Date Has Been Set!! We can't keep it a secret any longer! We are gathering the best of the best junkers once again and they are saving the cream of the crop for you. Just in time for the holidays. vendors get your applications in now! For all of the details visit our website at http://www.funkyjunksisters.com. 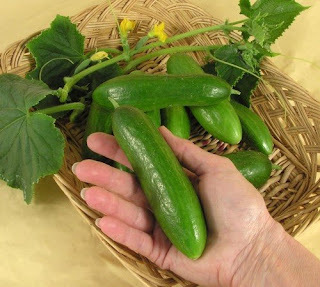 The first cucumbers in our garden are just about ready to be picked so we started looking for ways to use them and came across this recipe for a cucumber body scrub. The cucumber has the power to cleanse impurities, cool the skin, relax the soul and reduce discomforts of the skin. Mix together into a thick paste 1 medium cucumber, peeled and finely grated and 1 cup of organic buttermilk. Stir in 1/2 cup of sea salt, which will act as an exfoliant. Relax in a steamy bath for 5 minutes, allowing the heat to open your pores. Apply the cucumber scrub, avoiding cuts, scratches, or freshly shaved skin. Rinse thoroughly. We're off to try this out!! Vinyl designs have become so popular. Here are some creative ways to use them. 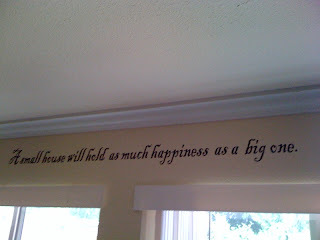 Dixie has a vinyl cutting machine and she made this saying for her home, it is above the window in her kitchen. This chandelier is one of our favorites. Don't forget about mirrors and windows. 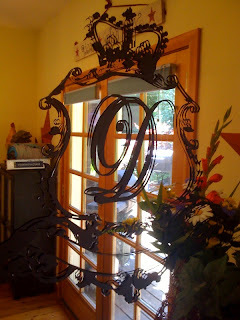 Dixie hung this mirror in her dining room. 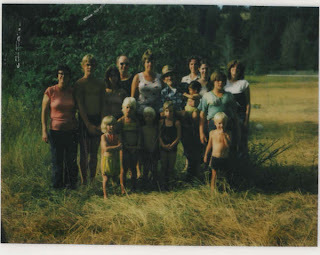 It is a little hard to see here but it is a family crest with a crown. The D in the middle is for DIXIE! 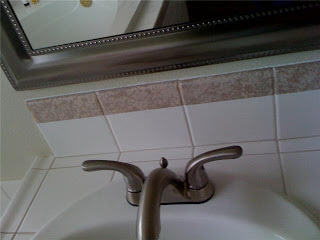 Here is a great idea I came across the other day when I was showing a house to a client. It's a great way to customize tile in a master bathroom. Dark paint was applied first, then the vinyl was applied in the middle of the tiles. After the vinyl, paint was applied with a sponge in a lighter color sparingly over the top. The technique was also applied to the top of the tiles around the back splash. 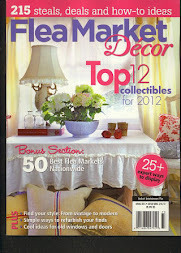 Visit Thechichousewife.com to see some of the other designs Dixie has available. Happy Birthday Dixie! May all of your birthday wishes come true. from all Junk Queens everywhere!!!!! 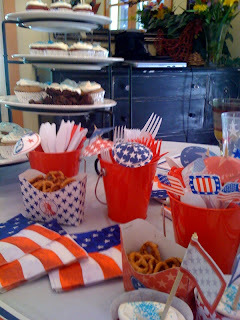 Dixie put on quite a spread for the 4th that included red velvet cupcakes with white icing and blue sprinkles. 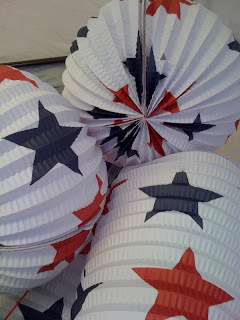 The Funky Junk Daughters made these darling patriotic parasols and placemats for our gathering with a download on the computer. Below are some pictures from our Funky Junk Sisters Show in June. Debi Ward Kennedy spoke to our vendors about the importance of display and we provided the drinks and snacks for the Friday night event. Our good friend Marty helped us out by providing vintage pieces to use as serving utensils. We just fell in love with the cart that was used to chill the drinks. Marty used an enamel ware mug as a scoop for the snack mix, so cute! It is so much fun to pull out vintage things and find new purposes for them... look around, you never know what you might find to use at your next party! 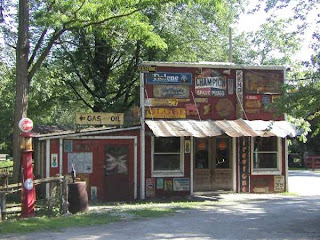 Wednesday we will set up camp with our Vintage Trailers and not so Vintage ones. This is the night of cocktails, bonfires, and s'mores. Sharing stories of the most embarrassing moments of the younger years... which always turns out to be about me (Dixie). Thursday morning the men will likely head out to catch some fish and the girls usually relax in the sun! 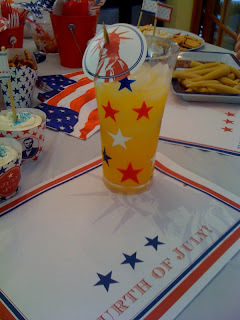 We would love to hear what you are doing for the 4th of July. We hope you all enjoy time with your loved ones, families and friends, we'll talk when we return!